How Can A Bodybuilder Add Inches To The Arms In The Shortest Time? ho_124 & Aussie_LTD want you to believe their strategies are the best. Do you agree? Our forum members have some varying opinions on building the best arms. Read on to see if you agree with them or not. TOPIC: How Can A Bodybuilder Add Inches To The Arms In The Shortest Time? For short, and even temporary gains in the arms, what can a bodybuilder do? Which exercises are best? Be descriptive (list sets, reps, etc.). Bonus Question: What were the most impressive gains you've made on your arms in a short period of time? How long did it take? Having large and muscular arms is probably the most sought after attribute of a bodybuilder or even amateur weight lifters. As a matter of fact some people place so much importance on arms that it's the only body part they even think about working out. For example there was a guy in the Best Of Forums who aked if there were any good bicep supplements because that's all he cared about. Hopefully that's not the road you're going down but either way trying to gain as much size as possible in a short amount of time isn't going to be easy. Whether your getting them prepped for a contest or are trying to give a boost to your arms because they are lagging behind, there are ways to accelerate growth in the arms in shorter periods of time. However once you have accomplished this goal using a workout or certain techniques, your arms will not likely grow at the same pace anymore because your body may have adapted to the workout. Or the techniques you are using just aren't having as much of an effect because your body has gotten used to it. So don't expect to use a technique all the time to keep adding mass to your arms, it doesn't happen like that. Just like how some people gain lots of mass in their first few months of bodybuilding because they shock their body into growing because it's a new stimuli for their body. But it's not like those people will be gaining all that mass at that rate forever, eventually it declines because your body has gotten used to weight lifting. The same thing will happen to your arms, if you are doing a workout or techniques that are adding size to your arms quickly, it's not like it will be growing at that rate forever. Like I said above, your body is going to adapt to the workout or techniques and eventually stop growing as much, just like if you keep doing a workout for over a year, you will plateau because your body will have adapted to your workout. Remember, this article isn't about getting constant gains, it's about adding inches in a very short time. Since we're going extra heavy on the arms this will mean that you don't want to be doing it for a long period of time or you will run the risk of burning out or overtraining. The workout I will list below should only be done for about 20 days at the most or else if you do it for more I can guarantee you will burnout. Remember you should only do this about once a year. Before I even start on this topic I want to say a few things of what not to do. And before I even get into that I want to say if you're just a beginner, you shouldn't even be reading this because right now you shouldn't be concentrating on gaining mass but getting introduced into weights. So if you are a beginner, go do several workout programs for a year or two before attempting to gain serious mass. You should be doing this only if you are intermediate or advanced and have been lifting weights for a while. Few people really know how to stack as much mass on the arms as possible. One of the most common mistakes people make is thinking that working out longer will guarantee results on the arms because more workload means the arms will build back bigger because it is under more stress. Well let me tell you that is totally wrong. There are a couple reasons for this, first of all, spending extra time on your arms might result in overtraining, which is the most obvious reason. Spending over one hour on arms will tax your recovery systems to a point where you won't be able to recover for your next workout. This will probably result in decreasing gains rather than an increase which some people don't know. To give you an example, one guy in my school works out for 2 hours each workout and he hasn't gained a pound because his recovery is being hampered by the workouts being too long. Secondly like I say in many of my articles, there is something called diminishing returns for each set for a body part after a certain point. This means your body will benefit very little after sets done after a certain point. So the benefits from the first set will be a lot more than if you performed a 20th set. The point where you don't want to do more sets is about 9-12 for each body part or 12-15 for larger body parts. Beyond that the benefits start diminishing. Therefore you shouldn't try to perform more sets than usual to gain more mass. The Key To Getting Inches On Your Arms. Your diet is something that will make you or break you. If you plan to get massive arms in a few months you have to make sure your diet is in check. If you have a poor diet, no matter how good your training regimen is, you will never get that much needed mass on your arms. You've heard it all the time, when combined with training and hard work, diet is 90% of how well you will do which is very true. So right now if you don't have a good diet, it might be the time to start one. But be reminded, if you're starting a new diet, don't start the workout for your arms yet since it takes about one month for your body to get acquainted with a diet. If you already have a good diet then all that is left to do is the training and techniques to gain some serious mass on the arms. For those who don't know what their diet should be like you're going to have to do a bulking diet. This is a diet meant for putting on muscle and I will quickly outline it below in a sort of crash course on bulking diet. This is the main thing about bulking, getting the right amount of calories. Muscular gains only happen when there is an excess amount of calories in which to build it from, so therefore you will have to be eating over your calorie maintenance level. Think about it, if you're a construction company and you are running low on bricks, do you think you could build a high rise building? No, you need an excess of bricks to do that just like the body needs an excess amount of calories to do that. Your body won't build muscle if it's in an energy/calorie deficit. Once you have calculated your maintenance level you want to be getting about 500 calories over which is a general rule of thumb. But for different body types it will be different so you will have to tweak it according to your body type. For example an ectomorph doesn't gain as much fat, so they might want to try getting 800 or even 1000 calories over. No matter what though, getting calories over the maintenance level is key and is the determining factor in gaining inches or gaining none at all. Protein is super important for gaining mass also. Without protein, your body will not be able to build muscle. So any lack of protein will hinder your bodies' ability to build muscle. Simply put, you need at least about 1 gram of protein per pound of bodyweight to ensure you have enough protein to stack on muscle. Now that we know how much protein we need, you have to get proper protein-carb-fat ratios. You should be eating slow absorbing carbs and protein during the day since it ensures your insulin won't be spiked resulting in fat gain and your body will constantly be fed nutrients to build muscle. You should be eating good fats and not bad ones which means eating your essential fatty acids which are omega 3-6-9 fats because your body can synthesize all needed fats from these except omega 3-6-9. So now that you know what kind of protein, carbs and fats to eat you should eat carbs-protein-fats in a ratio that resembles something like 40%-40%-20%. This means you should be eating that much percent of calories for that macronutrient, but of course you can alter the ratios to fit your needs. Eating six meals a day or more is very important. The reason why is because it provides your body with a constant flow of nutrients in which to build muscle. This is the main reason but there is more. Eating six meals will also ensure you won't gain fat because if you eat three meals a day your body stores fat as a defense against starvation. So eating meals frequently ensures your body won't store fat. Time working out should be at max one hour. But one thing you should note is that testosterone levels start dropping at about 30 minutes into the workout. So therefore the optimal time for an arm workout is about 45 minutes. Also if you go over one hour you shorten the window of opportunity (about 3 hours) in which nutrients are need to feed your body. To reduce the time working out you should reduce rest in between sets which is the next point below. Rest in between sets should be kept to a minimum to promote hypertrophy which means increased muscle size. The rest time should range from 30 seconds to about 1 minute and a half. This is a good rest time since muscles tend to grow when put under more constant stress. So if you rest for 3 minutes or over then your taking away from your muscular gains. The rep range will be totally different. Since I will introduce something below called the total fiber sweep, your rep range will be from 4-15 repetitions to target all the muscle fibers. I will get more into it below but what this basically means is that you will be going on heavy and light days. On the heavy days you will be doing 4-6 reps, and on the light day's 8-12 reps and 12-15 reps. This fiber sweep technique shouldn't be used all the time because it requires more workouts for each week. Like I always say, the workout I put up or the one that you see isn't always the best one for you. What works for you and what you like is the best workout for you. So if I recommend something that doesn't go for you or you don't really like then don't do it because I recommended it. So if that does happen where you don't like the workout I post, then it will be up to you to make your own workout. That's why knowing about certain techniques that will help you gain mass on your arms will be useful rather than just going through a regular workout. There are many popular extra techniques that I will list briefly, but you should never do these in excess in hopes of quick gains. You should use these techniques sparingly meaning you should never use them for every set. They should only be used on a few sets to fatigue you even more so your muscles respond to the extra load by growing back bigger and stronger. Below I will list the techniques and when it is a good time to perform them. Simply put, is where you take a heavier weight than you usually use so you perform less than your target rep amount. You then rest for about 10-15 seconds and keep doing that until you complete your target repetition amount. These are usually good on the compound movements since they are the big muscle builders. They are also good at the end of a workout since if you put them at the start of the workout you might not have enough energy to complete the last sets. These are where you pick a weight you can't do for the target amount of repetitions. Once you fall short of your target rep range you take a lower weight and keep doing the exercise until you get to your target rep amount. These are good at the end of a workout and on compound movements like rest-pause training because if you do them at the start of a workout you might get yourself too tired. This technique is tried and proven for the arms. Many people experience great gains when they superset biceps with triceps. It also has the advantage of keeping the blood constantly flowing in the arms and also it saves time. Saving time is important because as I said above, testosterone levels drop at about thirty minutes so therefore supersetting with arms will help you gain more mass. Very briefly, cheating is where you recruit other body parts or go in a certain position to help you complete a rep, partials is doing part of a rep where you can't complete a full one. And forced reps is where someone helps you complete the rep. These can be used more often than rest pause and drop sets since they don't exhaust the muscle as much, but still you shouldn't do them every set. There also really isn't a prescribed time to do them, but do them when you need to as a last resort. You must target all the parts of a muscle for optimal growth. For example there are many parts to the bicep and if you only work one part of it, it won't grow as much as if you work all parts of it. 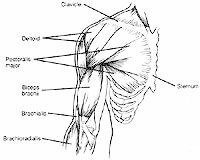 The anatomy for the biceps is as follows: Upper bicep, lower bicep, outer and inner bicep. This also includes the peak of the bicep which is somewhere in the middle of the bicep. For the tricep it consists of three heads, the medial, lateral and long heads and they must be targeted to ensure maximal growth. But the point is that you must work all these parts to make sure that your biceps and triceps will grow the maximal potential. The type I fibers which are the slow twitch. The IIA fibers which are the fast twitch fibers (with more endurance but slower contraction rate). The IIB which are the fast twitch fibers. Different repetition ranges target and promote growth in the three fibers as well as the speed of the repetition. This means that your workouts will consist of heavy days and light days. The heavy days will work the fast twitch muscle fiber IIB where the rep range will be about 4-6. And the light days will consist of days where the rep range is 8-12 and 15-20 to hit the other muscle fibers. You will have to also complete the repetitions with different speeds to hit the three different muscle fibers correctly. For the IIB fibers (Fast twitch) the repetitions should be performed more quickly or heavy to target these fast twitch fibers. However it shouldn't be done so fast that you can't control it but fast enough so that the weight is under control and your not going to drop it. For the light days where you work the IIA fibers (Fast twitch type two) you should perform the repetition at a normal speed and also for the IIB fibers which are the slow twitch fibers. With that said and done it is time to get to the workout. It also shouldn't be done on larger body parts because smaller body parts recover faster than body parts so therefore you can afford to workout more often for a month on the arms. It should be done every other day so you will have a heavy day where you work the IIB type fibers (Fast twitch) with a repetition range of 4-6 and a light day where you work the I and IIA fibers. You will do a heavy day, followed by rest then a light day followed by rest then a heavy day, then a rest and another light day. After you have done this you should rest for 2-4 days until you are ready to do another cycle. But this time you do a light day, rest then a heavy day then rest then a light day and do the 2-4 days rest again. You might even need to rest more to recover which might be OK. There will be two different workouts which will be rotated to prevent your body from getting accustomed to the exercises. Exercises may also be arranged differently to even further prevent your body from getting accustomed to the routine. Workout (1) - All Exercises Will Be Supersetted. Workout (2) - All Exercises Will Be Supersetted. Click Here For A Printable Log Of Day One Routine. Click Here For A Printable Log Of Day Three Routine. Click Here For A Printable Log Of Day 5 Routine. Click Here For A Printable Log Of Day 7 Routine. One thing I really want to say is if you don't like this workout, then you can make your own with some of the tips I listed above like the exhaustive techniques. Remember the best workout for me might not be the best for you. Again I want to stress that this workout is very stressful and should never be done for extended periods of time over a month. After your month is up take a good rest from arms and get back to your regular routine. This should only be done about once a year (usually on lagging body parts) since it is highly demanding and it jumbles up your workout schedule. Creatine is probably the best supplement for adding a lot of mass in a very short period of time. It is also great since it boosts ATP stores so you will have more energy for the explosive movements listed in the fiber sweep program on the heavy days. While using creatine some people have experienced a gain in mass of 5 pounds in their first few weeks of using it which only goes to show how good creatine is for promoting muscular gains in a very short period of time. If your going for as much mass as possible creatine is a must have. Whey protein is a very good thing to have and I would say it is almost essential if your doing the workout I listed above. Since you're doing a lot of arm workouts, you will need to try and recover as fast as possible; whey protein does that for you after a workout. Whey protein helps stop muscle breakdown and promotes protein synthesis when taken after a workout. Something good to take with whey protein is simple sugars since it works together with whey to stop muscle breakdown and build muscle. To View Top Selling Whey Protein Products Click Here. These are good supplements to boost testosterone levels naturally unlike many hormone boosters with unwanted side effects. ZMA only contains zinc and magnesium and tribulus is a natural plant. A boosted testosterone level is great when your trying to pack on as much mass as possible since testosterone is the hormone that is responsible for building muscle in the body. To View Top Selling Tribulus Products Click Here. To View Top Selling ZMA Products Click Here. Products such as No-Xplode, Xpand, Amped, Nox-CG3, etc., are all great before a workout. I used a loading workout similar to this one and I gained about half an inch in about 25 days. You might be thinking that's hardly anything at all but really half an inch is quite a bit. After that I rested a long time to let my arms recover and continued about my regular arm routine. After I did this routine I was very exhausted and I was almost at the brink of burnout which only goes to show that you should be very careful with this program and not do it if your not truly ready to do it. Now it's time to construct a game-plan to use there. In this section, I will list several important principles that will set you on the right path to getting those "Big Guns" that you want. Don't Disregard The Importance Of Rest (Temporary Gains). To get huge arms in the shortest amount of time, volume is going to have to be higher than what you're usually used to. As well as this increased need for volume comes an even higher need for additional rest. Rest and sleep is actually where you grow, not while training. When sleeping, your body is in its optimal environment for creating growth. Hormones are at their highest, among other processes. Try and get your conventional 8 hours of sleep per night, or slightly more if need be. Take naps, and do restful things during the day to recharge your self. Rest between sets and during training is just as important. Due to the lengthened workouts, it's important you are able to maintain your energy throughout the routine. It might be a good idea to schedule a whole day where your main focus will be training, so that there isn't anything that can disrupt you, and so you are devoting yourself 100%. "Train To Failure, Or You're Failing To Train." The above is a great saying I once heard. Training to failure, and getting bigger go hand in hand with size. If you never push yourself past your own threshold, you're failing to reach the next level. Try and take each set in your arm routine to failure, so you stimulate your muscles to the level they need in order to grow, and grow quick. Use Compounds To Pack On Those LBS. If you want big arms in the shortest amount of time, compounds are definitely the way to go. They allow you to lift heavy, and maximize hormonal response. Although isolation movements have their purpose in bodybuilding, this arm training routine leaves no room for fancy movements like dumbbell kickbacks or cable overhead extensions. Now it is time to hit the big weights, and hit them hard. Supersetting For A Superset Of Arms. Our goal is massive arms. Our quickest way of getting there is to maximize any training method that will allow us to get the most "pump" out of our training as we can. I can't think of any better way to get some of the freakiest pumps than by doing supersets. Supersets work perfectly with arms. I admit; they can be counterproductive with some body parts, but arms are an exception. When you're hitting biceps, your triceps are still 100 percent fresh and resting, or vice versa, so you're able to blow your arms up at no sacrifice. Each set in the routine provided later in this article incorporates the use of supersets. You'll see in the next section. Don't Ignore The Overall Growth Benefits Of Heavy Exercises. Heavy, free-weight exercises are the best mass builders in existence: The Squat, the deadlift, the bench press; they all speak for themselves. 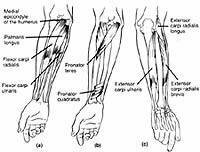 People often neglect the fact that your arms are heavily involved in many other movements. Therefore, to get massive arms, you should be doing heavy rows, deadlifts, pull-ups and presses. Ensure your back routine has barbell deadlifts and heavy free-weight rowing which should really add some thickness to those forearms and tri's. It should also have some pull-ups or close-grip pull-downs, which should really rip into those bi's with weights curling won't enable you to use. Pull-ups are one of my favorites - using a medium grip will really stimulate those biceps like nothing before. Forearms are actually half of your arm, yet a lot of us don't even train them. When you want big gains quick, this is no time to do isolation wrist curls, but that doesn't mean there are not other exercises that will blow up your forearms to match the size of your upper arms. Exercises like hammer curls and reverse-grip EZ-bar curls are excellent options at adding intimidating width to those lower arms. There are more exercises listed in the following section. Most of us know the eccentric part of the movement is just as important as the lifting part; especially with smaller groups such as biceps and triceps. Try and control the weight when lowering for a count of 2-3 seconds for each exercise, and pause for a contraction at the top of each rep. As well the eccentric portion, the positive, or lifting phase, should be just as slow. The aim is to really stimulate those arm muscle fibers, and a long time-under tension will ensure we are hitting them deep to the core. No Time For Fancy Exercises. Exercises like cable kickbacks or overhead-one-arm hammer grip rope extensions are great exercises, but our goal here in to increase mass, and do it quick. These exercises are good, but experiment later. Now we are on another mission. Like I always say, you can train, but without the food, you're never gonna grow. Especially important for this arm routine is Pre-workout, during and after-workout nutrition. The workout is going to long, so opt for some slow-digesting carbohydrates as well as protein about 2 hours before training. Aim for 35 grams of protein, and around 50-75 grams of protein and minimal fats. Take an energy enhancer supplement if need be. This is especially important time to fuel yourself due the increased demands of this workout. Have a ready-to-drink protein shake with you which will keep you anabolic, as well as maintain your blood-sugar levels. Aim for 50 grams of protein, and 50 grams of carbs, 5-10 grams of fat every 1-2 hours during training. Get in another protein shake immediately after training. 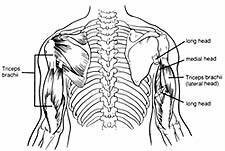 This will maximize that window of opportunity where your muscles are still in an overly-responsive state. Take 50 grams of protein, up to 100 grams of high G.I. carbs and some ALA too. Finally, we shouldn't forget to stretch. Stretch before training to prevent injury, during training and also after training to maintain flexibility. I find stretching during workouts keeps me warm during sets, and avoids me losing concentration. Before I go on, I have to remind you that this is a pretty crazy routine. Doing it weekly will lead to some serious overtraining, so use it in moderation. It's a twice a week routine, that can be used for a short time to either break a plateau, add some serious size in a short time or for an immediate pump that will drive the girls crazy. Click Here For A Printable Log Of Freaky Mass Routine. *Routine notes: This is a great program because you can still do it if all you own is free-weights. It focuses on heavy lifting and compound movements, which with the addition of supplements like NO and creatine, will blow your arms up like crazy. Because the pump is our aim, try and keep rest minimal during supersets, around 2-3 minutes max. These are a traditional triceps mass builder that will allow you lift massive amounts of weight to thicken those tri's. Using a rep range of 6-8 reps will compliment the mass building benefits close-grip bench press provides. These are a great power movement that will allow you hit your triceps with max. force. They will hit all heads of your triceps, with an emphasis on the lateral head, or the outer part. I recommend 5 supersets of 6-8 reps. This exercise is a compound but at the same time will simultaneously provide the sculpting benefits of using cables. They are another power movement that you should be able to heavy with. I recommend sticking to 6-8 reps, like most compound exercises. These are in my eyes the second best tricep mass builder behind close-grip bench presses. Using a decline on extensions will allow you to hit all 3 heads as opposed to just two, turning it into more of a compound. These are the king of bicep exercises. They aren't popular for no reason; they are easily my number choice for building mass to the biceps. 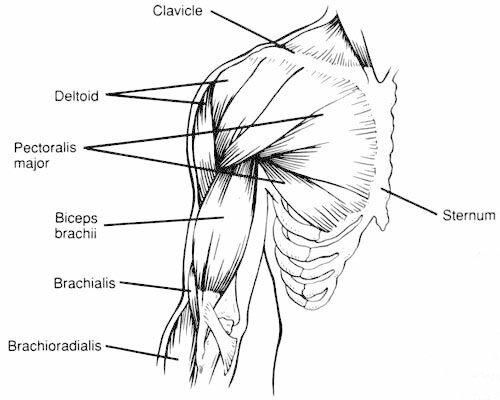 They will hit both heads hard, as well as the brachialis. Experiment with grip width, which should shift the tension from the long head to the short head. I recommend 4-5 supersets if quick mass is your aim, with a rep range of 6-8. These are another compound that will hit all heads of the biceps equally. They can be done either seated or standing, or against a wall to minimize cheating. Supinating the wrists during the lift I feel can hit the upper portions of the biceps, especially if you learn to contract at the top of each rep. 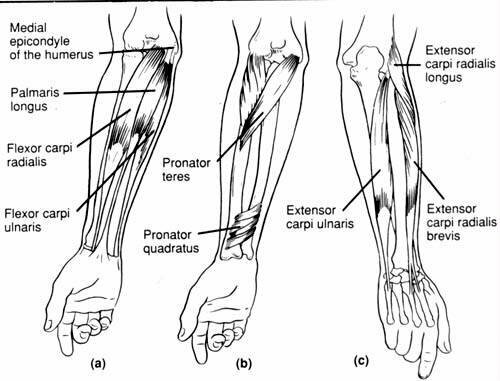 The different wrist positioning here means the exercise will better target the forearm muscle, as well as the brachialis on the lower part of the bicep. Yet, they are still a compound movement that will provide mass benefits. They tend to hit the long head more, whereas incline curls will hit the inner head. 5 supersets in this routine should be sufficient to stimulate those forearms. Do you find yourself asking, 'but these aren't a bicep exercise?' Traditionally they aren't, but if you give them a go, I guarantee you will feel something in your biceps you've never felt on conventional bicep curling exercises. First, they allow you to lift a lot more weight than is possible with curling exercises such as bicep curls. Second they are a bodyweight exercise. I find bodyweight exercises like pull-ups, chin-ups, chest dips are some of the best exercises around. Nitric Oxide: Blow Your Arms Up Like Bubbles. This stuff is amazing. I have used it for some time now, and compared to the times when I didn't, I never knew what I was missing out on. Considering this arm workout lasts 2-3 hours, you're going to want to make sure you have what it takes to sustain your pump. A NO product will definitely help. This has everything in it. When it comes to complete supplements, I don't think anything compares to Animal products. If you want a good quality bodybuilding-specific multi, try Animal Pak. Creatine is one of the most potent natural anabolic substances there is. It should work hand in hand with nitric oxide to provide a sustained pump that will be out of this world. Take 5 gram serves before and during your workouts, or more, mixed into an easily digested source of carbohydrates such as maltodextrin. This is a great product by a great brand. Ronnie sponsored BSN also has a great NO product called No Xplode that you should try. It was rated as Bodybuilding.com's nitric oxide AND mass builder of the year. Having protein ready to drink allows a quickly prepared source you can take easily while you workout. This is important with the arm workout provided to help maintain the most anabolic environment you can for your arms to grow the max. amount in the shortest amount of time. This is an all in one protein shake that should have both your protein requirements, as well as give you the nutrients you need to both maintain energy throughout your workouts at the same time. This is highly recommended, especially with the high demands of this extreme arm training. These are the essential amino acids leucine, isoleucine, and valine that are vital for recovery and muscle repair. If you want massive arms, it's not only about the training, but also your ability to recover. Without enough amino acids, I doubt your gains on this program will anywhere near what you aiming for. Take glutamine as well for enhanced recovery. This is a trusted BCAA supplement that is both reasonably priced and effective. I choose to use this brand for their reputation and personal benefits I've gotten. What were the most impressive gains you've made on your arms in a short period of time? How long did it take? I have used the program prescribed in this article twice. Although I didn't have a tape measure with me at the time, just looking at my arms, I could see they were clearly 2/3 - 1 inch bigger. The pump I got from the program was incredible; the magic of the program lies in the fact that the biceps and triceps are opposing muscles groups and doing supersets means you are blowing your arms up at once. Just the sight is incredible. I advise you give this program a try; either for a change, to avoid a plateau, or just to show-off your guns if your going to the beach. Although it may be incredibly intense, the results will speak for themselves.